↑ Images were taken on October 21, 2003; the object was not detected and identified until 2005. ↑  Both are common; the former is the literary pronunciation of the name, but Brown and his students use the latter. ↑ ၈.၀ ၈.၁ "Size, density, albedo and atmosphere limit of dwarf planet Eris from a stellar occultation" (2011). European Planetary Science Congress Abstracts 6. Bibcode: 2011epsc.conf..137S. Retrieved on September 14, 2011. 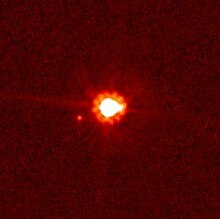 ↑ "The Mass of Dwarf Planet Eris" (15 June 2007). Science 316 (5831). doi:10.1126/science.1139415. PMID 17569855. Bibcode: 2007Sci...316.1585B. ↑ "Characterisation of candidate members of (136108) Haumea's family" (February 2010). Astronomy and Astrophysics 511: A72. doi:10.1051/0004-6361/200913031. Bibcode: 2010A&A...511A..72S. ↑ "The trans-Neptunian object UB313 is larger than Pluto" (2 February 2006). Nature 439 (7076): 563–564. doi:10.1038/nature04494. PMID 16452973. Bibcode: 2006Natur.439..563B.